Amy Milton is a writer in St. Louis who graduated from the University of Missouri – St. Louis fiction MFA program in May 2013. She is currently employed in the communications and marketing department at the Missouri Institute of Mental Health. When she is not working or writing, she performs stand-up comedy at various local venues, goes on a lot of hikes, and reads too many science and feminism blogs. Despite all evidence to the contrary, she believes that the most perfect car ever is the 1996 Toyota Tercel and will be devastated when they are no longer available. 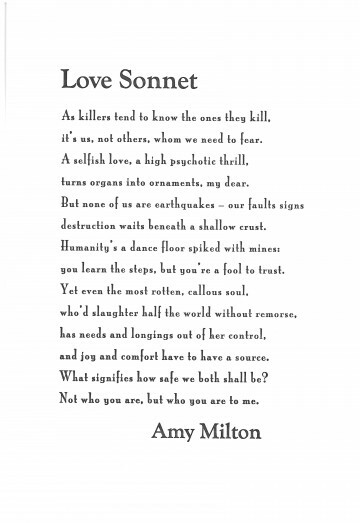 Amy Milton is sticking to her iambic pentameter guns, a bandolier of end rhymes draped across her chest. What’s truly dangerous, though, is her sharp, English Renaissance-style wit. Clever turns of phrase like “A selfish love…/ turns organs into ornaments” convey, in compact detail, both the pitfalls and high stakes of love. How frightening, then, to realize the safety of our organs relies on others’ perceptions (“Not who you are, but who you are to me”) something we can’t control. It’s enough to make a person want to pass on love entirely, but “even the most rotten, callous soul/ …has needs and longings out of her control.” So what to do? Despite describing love as warfare (two places where, as the saying goes, “all’s fair”) this poem advocates for the golden rule. Not because it offers a guarantee – there are none of those – but because being kind is most likely to endear you to those you’re closest to, the very same people who can hurt you most deeply. It’s at once selfless and Machiavellian. Ben Johnson would be proud. A poem that addresses intimacy and its pitfalls using the lexicon of warfare should look both delicate and dense, cold and warm. Mona Lisa Solid’s thick vertical strokes, small bowls and tall ascenders create a solid field of hash marks while maintaining significant white space. The apostrophes ride high above the letterforms like balloons or grenades mid-arc. The dots of the lower case i’s could be daggers or candle flames. It’s all in how you decide to see it.